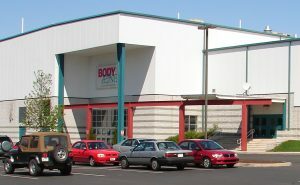 Body Zone Sports and Wellness Complex delivers a unique and complete sports and wellness experience for the entire family. There’s simply nothing like it in Berks or surrounding counties. Our 160,000 sq. ft. facility in Wyomissing, PA houses an award-winning and state-of-the-art wellness and aquatics centers, Body Zone Physical Therapy, suspended running track, two NHL-size ice rinks, two Sprinturf synthetic grass sports fields, basketball/volleyball court and cafe. With more than 25,000 square feet of space devoted to fitness, aquatics, physical therapy and massage, we make it easy for people of all ages to get active and be healthy. Whether you’re new to a club setting or a pro at organized fitness, our community of more than 80 wellness professionals and staffers are on hand to help you make your transition to a healthier you. Take your fitness journey to our courts, fields and rinks and participate in a sports league, camp or instructional clinic. Learn how to play Pickleball or Kronum or simply take the family ice skating. Introduce your child to physical activity through our tot sports and play programs. Celebrate them with a unique Body Zone party. We’re your headquarters for unique, engaging and healthy activities. Body Zone’s mission is to provide an inviting, innovative and community-based facility that offers a multitude of competitive, fun and lifestyle enhancing opportunities to all of its members and guests through a commitment to the development of sports and wellness.